The Needle Bug is a full service needlepoint store! Services include customization and monogramming, stitching, and finishing. The Needle Bug will be happy to have a custom canvas designed to fit your need. There are some designs that are ready for just the initials to be added. Prices vary depending on your choosing. As well as having the canvas designed, The Needle Bug will also have one of their national teachers write a personalized stitch guide. Along with needlepoint, we also offer monogramming. If you need something to be personalized, just come to The Needle Bug. We will monogram items such as totes, ‘Walker Bags’, etc. Have a question about a piece? Email us. If you are a busy stitcher, but find that you cannot complete a project or just want to have a piece stitched for you, give us a call. We will provide an estimate once you select your canvas. Canvas can be stitched in both basketweave and/or decorative stitching! From start to finish, The Needle Bug is here to assist you. Ornaments, stockings, pillows, purses, belts, bracelets and so much more! 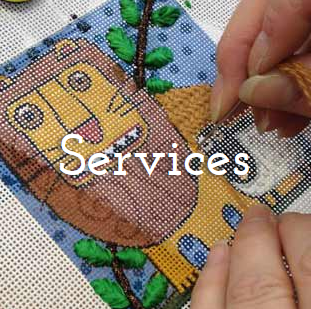 We can make your stitched project into a needlepoint treasure! Please allow a minimum of six weeks for most finishing. Some items such as belts, shoes, etc. require additional time. Finishing due dates are listed below and they are also posted to our BUG calendar. Items received after those due dates cannot be guaranteed. Costs vary...once a piece is stitched we make it into your treasure! We specialize in providing a suite of canvases for religious facilities.